In 1926, two brothers named Norman and Joe Gledhill started a business producing domestic copper cylinders in Blackpool. The business grew and despite a hiatus during World War 2, Gledhill was a successful family run enterprise by the 1950s with Norman’s wife and sons, Keith and Houghton, also working for the company. Norman and his wife retired in the 1960s and, while Keith and Houghton continued to work for the new owners for a time, in 1972 they started their own cylinder making business under the Gledhill name. In 2015 the brand was acquired by an international heating manufacturer, Groupe Atlantic. Gledhill’s StainlessLite range of unvented cylinders is one of the widest you’ll come across. Within the range they have both indirect and direct cylinders for gas and oil boilers and cylinders which are compatible with solar thermal, heat pumps or even both. Gledhill have also produce horizontal and slimline options to suit smaller installations and a simpler, ‘budget friendly’ option called the StainlessLite ES. Capacities range from 60 to 400 litres, so Gledhill really have covered all the bases. The cylinders are made from Duplex stainless steel to resist corrosion and include 50mm of HCFC free foam insulation for maximum energy efficiency. Despite the high quality of the construction Gledhill have managed to produce the lightest cylinder on the market which can aid in a simpler, quicker and possibly cheaper installation. Gledhill also offer a range of vented cylinders including the Torrent Stainless OV, the Torrent Stainless OV SOL, the Torrent Stainless SP SOL, the Envirofoam Copper, the Envirofoam Stainless and the Pulsacoil Eco Stainless. StainlessLite Plus Indirect 60, 90, 120, 150, 180, 210, 250, 300, 400 Yes – capacities between 90 – 300 litres A / B / C (depending on capacity) Designed for use with a gas or oil boiler, either System or Regular. Slimline model also available for homes with limited space (in capacities between 90 – 210 litres). 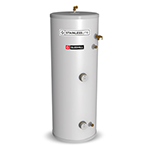 StainlessLite Plus Horizontal Indirect 180, 210, 250, 300 No C Designed for use with gas or oil boilers. This is a horizontal cylinder for height restricted installation spaces. StainlessLite Plus Solar Indirect 180, 210, 250, 300, 400 Yes – capacities between 180 – 400 litres. B / C (depending on capacity) Designed for use with solar thermal panels. Slimline model also available for homes with limited space in 180 or 210 capacity. StainlessLite Plus Horizontal Solar 180, 210, 250, 300 No C Designed for use with solar thermal panels in addition to a gas or oil boiler. This is a horizontal cylinder for height restricted installation spaces. StainlessLite Plus Heat Pump 180, 210, 250, 300, 400 N/A B / C (depending on capacity) Designed for use with air source or ground source heat pumps. Slimline model also available for homes with limited space in 180 or 210 capacity. StainlessLite Plus Heat Pump Solar 180, 210, 250, 300, 400 N/A B / C (depending on capacity) Designed for use with air source or ground source heat pumps in addition to solar panels. StainlessLite Plus Buffer Store 90, 120, 210, 300, 400 N/A A / B / C (depending on capacity) Designed for use with either air source or ground source heat pumps. Buffer stores increase the overall volume of the heating distribution system to reduce the cycling of the heat pump. StainlessLite Plus Flexible Buffer Store 90, 120, 210, 250, 300, 400 N/A A / B / C (depending on capacity) Open vented cylinder with connections for multiple outputs suitable for use with air source or ground source heat pumps, wood burning stoves or open vented boilers. StainlessLite ES Indirect 90, 120, 150, 170, 200, 250, 300 Yes – capacities between 90 – 300. B / C (depending on capacity) The ES is Gledhill’s value range of cylinder, designed to be competitively priced. Gledhill include a 25 year warranty on their cylinders with a 2 year warranty on all other parts. It’s worth noting that these warranties begin from the date of manufacture, not the date of installation. A cylinder from Gledhill is likely to cost in the region of £400 – £1,200 depending on the model and capacity you need. You will also need to factor in the cost of installation which will vary from installer to installer. The simplest way to save money on the cost of a new unvented cylinder is to compare quotes from 2 or 3 different suppliers. Complete our simple enquiry form to get free quotes from up to 3 qualified and reputable engineers in your area.